Laura and I have been planning a how-to on the Ivy knot for a while, and now seems like a great time to actually put it up, given Lolly's recent post on handknit fashion. Follow the instructions below to tie your own Ivy knot -- we've written them as if you are looking down at the scarf as you tie it around your neck. First, fold the scarf in half and place it around your neck so that the folded side falls over your right shoulder at about bust height. 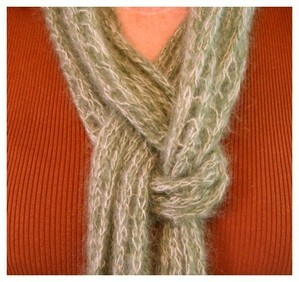 The fold is the loop through which you will be drawing the two ends of the scarf. Next, draw one of the ends of the scarf through the loop from left to right. Now take the second end of the scarf and draw it behind the loop, then draw it through the loop from right to left. Adjust the knot to lie flat and to desired height. Congratulations -- you and your scarf look fabulous!